Gusty winds are expected to sweep through San Diego County mountains and deserts Monday and cause potentially dangerous driving conditions. The wind advisory means that sustained winds of at least 35 mph are expected, according to the weather service. The westerly winds are expected to range from 25 to 35 mph, with gusts reaching 50 mph possible, forecasters said. 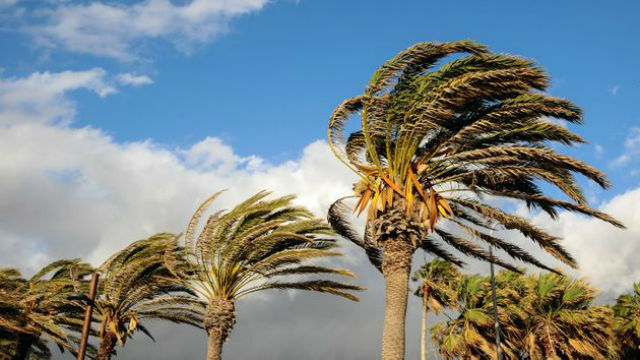 Powerful winds could whip up sand and dust sand create potentially hazardous driving conditions, especially for high-profile vehicles, the weather service warned. A low-pressure system is expected to reach the region Monday evening and bring a slight chance of showers through Tuesday, forecasters said. There is a 20 percent chance Monday evening in coastal and inland valley areas, but that will increase to a 50 percent chance Tuesday everywhere except the deserts, which has a 20 percent chance, according to the weather service. High temperatures Monday will be 63 to 68 degrees at the beaches and inland, 65 to 70 in the western valleys, 59 to 67 in the mountains and 81 to 86 in the deserts.